This is cool: "Axios on HBO" premiers this Sunday at 6:30pm ET/PT, with a replay at 11:30pm. It's a 4-part docu-news series on the big trends, big ideas and big personalities reshaping America in real time. Situational awareness: ExxonMobil beat analysts' expectations this morning, as it reported Q3 results showing earnings of $1.46/share and revenue of $76.61 billion. Per CNBC, analysts are particularly interested in Exxon's refining operations after executives warned in July that investors should expect significant refinery maintenance. Remember the old days of very early October? That's when rising prices were spurring talk of oil climbing higher and higher and maybe — maybe — reaching $100 per barrel in coming months? And, now? Just days away from formal reimposition of U.S. oil sanctions against Iran, the world looks very different. Driving the news: Oil prices have been on a generally downward path for a month, with more significant declines this week. West Texas Intermediate yesterday traded at it lowest levels since mid-April and Brent, the U.S. benchmark, was at it lowest level since mid-August. In early trading this morning, WTI was slightly lower at $63.51 and Brent ticked up to $72.94. Supply: There's plenty of oil sloshing around, with the latest evidence coming Wednesday when federal data showed U.S. production reached an eye-popping 11.35 million barrels per day in August. Surveys by Bloomberg and Reuters show that OPEC output climbed to over 33 million barrels per day (mbd) in October. Policy: U.S. officials have signaled that there's some wiggle room for countries that are moving to cut Iranian imports to avoid immediate sanctions against their buyers (more on that in a moment). Vibes: Saudi Arabia, which has the most spare capacity in OPEC, has sent reassuring supply signals of late as the kingdom has been under pressure over the murder of Jamal Khashoggi. Headwinds: The International Energy Agency trimmed its 2018 and 2019 global demand growth forecast in a mid-October report, while trade friction with China also erodes confidence in the extent of global economic growth. The latest: Via Bloomberg this morning, "The U.S. has agreed to let eight countries — including Japan, India and South Korea — keep buying Iranian oil after it reimposes sanctions on the OPEC producer on Nov. 5, a senior administration official said." "Although the price decline seems counterintuitive as concerns about Iran and Venezuela mount, market sentiment has shifted markedly from just one month ago, in line with our view." Don't expect oil to remain this low, some analysts caution. What they're saying: “Fundamentally, we do think that the prices should move higher from here,” says Paul Sheldon of S&P Global Platts Analytics on a new episode of the Platts Capitol Crude podcast. “There has been a lot of noise and a lot of bearish headlines lately, from a lot of demand concerns and trade war headlines to weakening growth in potentially Europe and the developing world,” Sheldon says. But he adds that sanctions actually kicking in and other forces will impose pressure in the other direction. McMonigle, in our interview and a research note yesterday, says that despite the recent news about flexibility, the Trump administration will ultimately take an aggressive approach on sanctions. His note also predicts that the Saudis and some other producers will ease off their production boosts after the midterm elections. What's (maybe) next: McMonigle sees prices back in the $85 range by mid-December, thanks to a number of forces. But Barclays' Cohen sees Brent prices averaging $77 in the fourth quarter of this year and averaging $72 overall next year, albeit with risk "skewed to the upside." "If the Saudis aspire to $90 because of recent events and if Nigerian or Venezuelan output falls more than we assume, then we could be back above $80/b sometime next year," Cohen writes. "Trump's sanctions against Iran will be less successful than those imposed in 2012, when the Obama administration had near universal international support and the sanctions were backed by both the UN Security Council and the EU," says Slavin, who directs the Future of Iran Initiative. "Iran will try to wait out the Trump presidency in hopes that a successor will return to the 2015 nuclear deal or seek new negotiations based on more realistic premises," she writes. Read more of Slavin's Expert Voices piece in the Axios stream. Leading officials of the world’s biggest countries, fossil-fuel companies and finance banks are meeting later this month in Scotland for one of the largest-ever summits on technology capturing carbon dioxide emissions, Axios' Amy Harder reports. Why it matters: This technology is increasingly considered essential to address climate change given how carbon-intensive the world’s energy and industrial systems are. But it remains too expensive in most instances. The gap between what’s needed and what exists today is staggering. Details: Conference organizers hope the summit will produce more support, including financing, for carbon capture projects, but they have not yet disclosed specific "deliverables" they hope the event will yield. The International Energy Agency is convening the event, with roughly 50 high-level officials across private and public sectors. Samantha McCullogh, who runs IEA’s work on this technology, said the addition of the finance sector is of particular note given it has been lacking in previous gatherings. “It really does take partnerships between governments and industry,” said McCullogh. She cited a proposal in Norway, whose government and industry officials will be at the meeting, as a good example. But there, questions of who will fund it loom large. What’s next: Expect global focus on this technology to continue at the United Nations’ annual climate conference held just a few days after in early December. Coal-dependent Poland is hosting the event, with Kurtyka as the president of the conference. 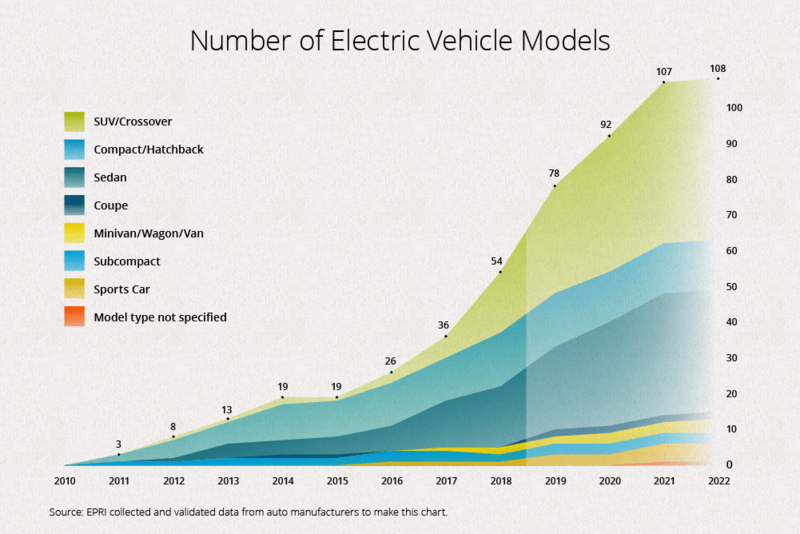 The number of electric vehicle options available to U.S. buyers is slated to nearly double over the next few years, reaching a projected 108 in 2022, according to the nonprofit Electric Power Research Institute (EPRI). The graphic above, from this brief report, represents pure EVs and plug-in hybrids. Why it matters: Wider choices — along with greater range, cheaper options and more public charging infrastructure — are among the forces that can help drive greater adoption of EVs. Today they're an extremely small, albeit growing, portion of vehicle sales. By the numbers: Speaking of range, the average for battery EVs was 192 miles as of the end of 2017 (it's already longer now), and that's slated to average around 250 miles by 2022, EPRI said. "Tesla 'probably would not' take money from Saudi Arabia in the wake of the death of Saudi journalist Jamal Khashoggi, Chief Executive Elon Musk said." Flashback: When Musk rolled out his now-abandoned plan to take Tesla private, he said he'd been in advanced talks with the Saudis' sovereign wealth fund about bankrolling the deal. Power: "The CEO of the PJM Interconnection said Thursday that a federal bailout for coal and nuclear plants is unnecessary, but higher payments to generators that store fuel onsite may be needed in the mid-2020s," Utility Dive reports. "The massive find ... has reignited a century old territory dispute with its powerful and volatile neighbor Venezuela, flaming geopolitical tension in a region where the United States, China and Russia are increasingly competing for influence," James Osborne reports. Climate: Via The Hill, "Three federal agencies said Thursday that they’re working to embrace burning trees and other biomass to create energy in a 'carbon-neutral' way." Yes, but: "Labeling wood burning as environmentally friendly is at odds with environmental groups and some scientists, who say that the process of creating electricity, steam or other energy forms from wood releases all of the carbon dioxide that the trees had previously removed from the atmosphere," the story notes. Marine heat: The world's oceans have absorbed about 60% more heat during the past 25 years than previously estimated, according to a new study published in the journal Nature. The study takes advantage of a new method that can serve as a whole ocean thermometer, Axios' Andrew Freedman reports. Read more: Andrew's story is in the Axios stream. Deforestation: Axios' Diego Rodriguez writes ... The environmental platform put forward by Jair Bolsonaro, Brazil's right-wing president-elect, could cause a rise in greenhouse gas emissions and a 268% spike in deforestation, according to a simulation from the National Institute of Space Studies in Brazil. Why it matters: The simulation took into account policies like increased deforestation in Amazonian territory, non-protection of indigenous territory and an eventual exit from the Paris Climate Agreement, among others. Go deeper: Read Diego's story in the Axios stream.